Update: Bella Habana is closed. As we planned our St. Pete Beach wedding, there was no doubt we were going to have our rehearsal dinner at Bella Habana, a casual Cuban restaurant with a cute patio and live music. Why Bella Habana? It was the restaurant where R. and I had our first meal together more than six years ago. And so, the twenty of us jammed into a small private room and we ordered off the menu. We were asked many times if we remember what we ate on our first date, and sadly, the answer is no. If only I had been blogging then! I know I'm biased in my liking for Bella Habana, and because of my blogging people tend to expect good food recommendations from me, so I was already worried that our families would not like Bella Habana as much as we do. Sure enough, the evening started off with some rough patches: Our waitress spoke limited English (could be a good sign of an authentic eatery...right??) so there were some communication problems during the ordering process. Then we waited a looong time for our food, which, when finally ready, arrived not all together but one dish at a time. We had been at the restaurant for a full two hours by the time the last dish came out! 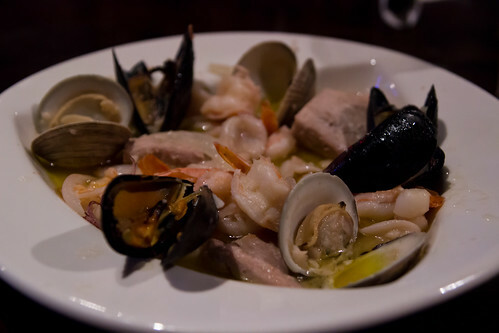 I had ordered the Cazuela de Mariscos al Ajillo, or in plain English, sauteed shrimp, scallops, calamari, and mussels in wine, garlic, olive oil, and lime juice, and it was very good. 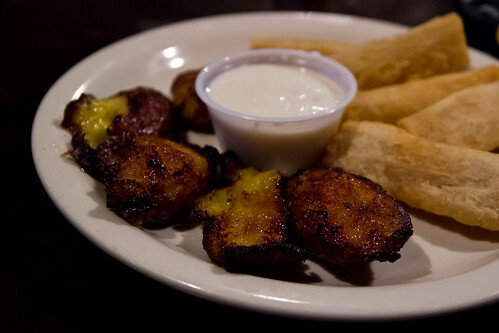 My two sides of Sweet Plantains and Yucca Fries were absolutely perfect, some of the best I've ever had! 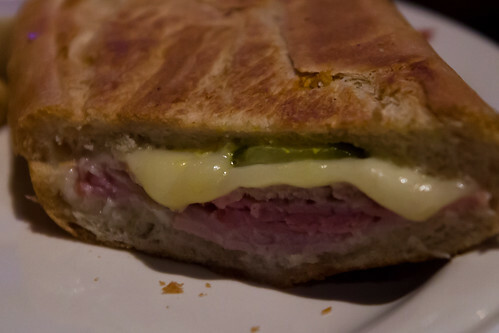 R. ordered a Cuban Sandwich, with smoked ham, roast pork, Swiss cheese, dill pickle, and mustard, which he loved, and I can attest to its tastiness as well. The poor groom's was the last dish to arrive, so I let him start on one half of his sandwich before I snapped a photo. 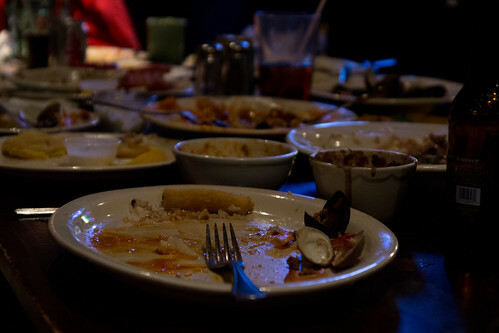 Empty plates and happy stomachs! In retrospect, it was definitely a good time at Bella Habana, and I'm glad to be able to bring our families here to our special spot. And six years from now, if someone were to ask me if I remember what I ate at my rehearsal dinner, my answer will be a resounding yes!